Hotel ratings are often used to classify hotels according to their quality. Centrally located in the heart of upscale Banjara Hills 5- star luxury hotel Park Hyatt Hyderabad offers an unforgettable experience to business travelers and discerning local guests who appreciate contemporary luxury and seek personalized service. 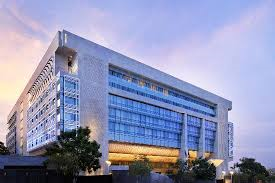 conveniently located between the international airport, Hi-tech City and the Central Business District, Park Hyatt Hyderabad offers 185 spacious and stylishly designed rooms and 24 suites that feature the latest in-room technology for the corporate traveler looking for a retreat in the finest hotel in Hyderabad. Park Hyatt Hyderabad is also the first luxury business hotel in the city to offer 42 fully serviced luxury apartments for long staying guests who are looking for a home away from home. Park Hyatts around the world are known for their signature restaurants -- and Park Hyatt Hyderabad is no exception. Tre-Forni Restaurant and Bar offers the light and flavorful dishes of Northern Italy, and the Oriental Bar and Kitchen serves a menu of South-East Asian specialties. Closer to home; The Dining Room offers an International and Indian menu with a choice of regional Hyderabadi dishes. At Park Hyatt, we are committed to make your stays comfortable, memorable and commendable. We serve all our guests with unparalleled dining experience by presenting a perfect blend of classic European cuisine and authentic Indian comfort food in a classy ambiance. Park Hyatt Hyderabad hosts its guests with a fairy tale stay in splendid modern surroundings. It takes to provide enriched dining experience, world class comfort and a perfect blend of luxury and convenience to be one of the most sought after luxury hotels in Hyderabad. Park Hyatt Hyderabad’s extensive meetings and events facilities, measuring over 1,595 sq mts (17,162 sq ft), supported by a dedicated and experienced Events team. Positioned to host all types of meetings and events in this technology-driven city, the meeting and events facilities will include a pillar less ballroom, a pre-function area and seven meeting rooms. Designed to accommodate large and small groups, the hotel is the first in India to offer Hyatt's unique residential-style multi-function facility – The Manor. The 5- star luxury hotel's flexible and intimate meeting spaces exude a warm home-style ambience for meetings and social functions.